In an extraordinary lineup of international support, the UN General Assembly voted overnight by a more than two-thirds majority to recognize the State of Palestine within the 1967 borders, a move vehemently opposed by Israel and the United States. The 193-member world body approved the resolution upgrading Palestine’s status to a nonmember observer state at the United Nations late Thursday by a vote of 138 in favor to 9 against, with 41 abstentions. The vote was a victory decades in the making for the Palestinians after years of occupation and violence. It was a sharp rebuke for Israel and the United States. The vote grants Palestinian President Mahmoud Abbas an overwhelming international endorsement for his key position: establishment of a Palestinian state in the West Bank, Gaza Strip and East Jerusalem, the territories captured by Israel in the 1967 Arab-Israeli war. Abbas told the assembly the vote was the "last chance to save the two-state solution" with Israel. "Sixty-five years ago on this day, the United Nations General Assembly adopted Resolution 181, which partitioned the land of historic Palestine into two states [one Arab, the other Jewish] and became the birth certificate for Israel," Abbas said shortly before the vote in New York. "The General Assembly is called upon today to issue a birth certificate of the reality of the State of Palestine," he said. Joining Israel and the United States in voting “no” were Canada, Czech Republic, Marshall Islands, Micronesia, Nauru, Palau and Panama. Of the “Big Five” permanent members of UN Security Council, three voted in favor (China, France and Russia), one abstained (UK) and the fifth voted against (U.S.). The vote highlighted the lack of unity as well among the 27 member states of the European Union. But it also marked a drain in sympathy for Israel in Europe. 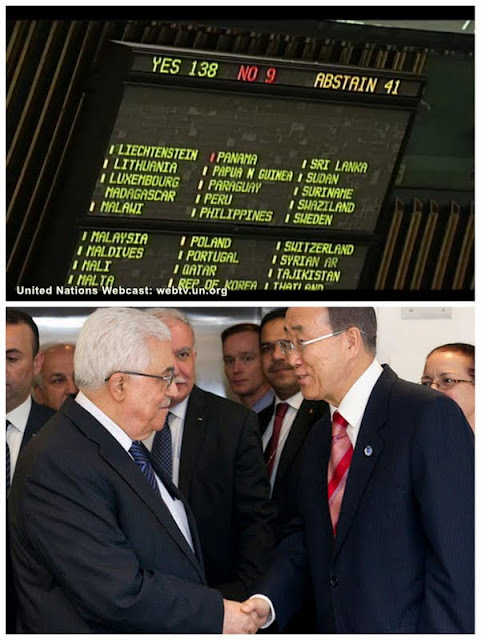 Just one EU country -- the Czech Republic -- voted against Palestine upgrading its status within the world body. Fourteen others -- Austria, Belgium, Cyprus, Denmark, Finland, France, Greece, Ireland, Italy, Luxembourg, Malta, Portugal, Spain and Sweden -- voted in favor (as did non-EU members Norway and Switzerland). The remaining 12 EU members -- notably Bulgaria, Estonia, Germany, Hungary, Latvia, Lithuania, Netherlands, Poland, Romania, Slovakia, Slovenia and United Kingdom -- abstained. The vote grants the Palestinians the same status at the UN as the Vatican, and they will keep their seat next to the Holy See in the General Assembly chamber. The Holy See promptly issued a communiqué after the vote stating in part: “Considering the outcome of today’s vote of the General Assembly of the United Nations, and to encourage the International Community, and in particular the Parties directly concerned, towards concrete action in view of the aforementioned objectives, the Holy See welcomes with favor the decision of the General Assembly by which Palestine has become a Non-member Observer State of the United Nations.